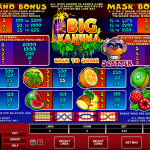 Take a trip on a remote paradise island on the reels of Big Kahuna, a popular Microgaming oldie. What better way to pass the summer than a long vacation on a beautiful island with sandy beaches and cool seas. Well Big Kahuna offers the full package, but you may get more than you bargained for. The island is home of a native tribe which aren’t too fond of outsiders. So you better stay on their good will if you don’t want to end up in the volcano as a human sacrifice to their island gods. The Big Kahuna Wild can land on all of the reels, but will substitute only for the fruit symbols. The slot also has a scatter symbol in the form of a Monkey with a 200 x stake maximum payout, but without any bonus features attached. If you want to trigger a bonus in this slot you will need to land 3, 4 or 5 volcano symbols on an active pay line or 3, 4 or 5 Mask symbols. Both symbols trigger similar features. In both features you need to make picks and collect cash prizes. 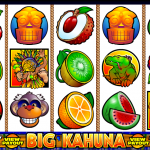 Big Kahuna doesn’t have a classic free spins bonus round attached, which would make it more appealing to online players. 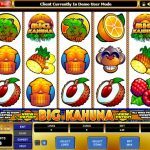 Big Kahuna was once a very popular slot across Microgaming casinos, before the modern video slot games gradually pushed it from its throne. The game has a simple design and lacks modern features which are native to newer slot games. Still the slot is quite popular among long time Microgaming fans who like to hit a few spins from time to time and remember the good old days when Microgaming software was king of its realm. If you feel like you need a vacation then you should consider playing Big Break a 5 reel slot by MicroGaming.